In this video I show you four of my favorite ab exercises that you can do at home to get your abs ready for the beach. If you try these let me know what you think! Bought myself a ball, and started this today! Thanks!! These are great! Thanks for sharing. How many days a week do you do these? Great video! I’ve had a weighted med ball forever but never used it. This will be great to finally try it out :). By the way, what kind of pants are those you’re wearing in the video? I like them. Thanks. Thanks for posting! 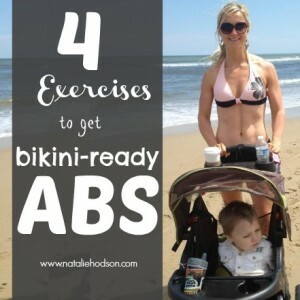 New to your blog and I love having more ab exercises to add to the ones I already do. I’m determined to get my stomach/core strength back after having 2 kids! Thank you so much for posting this! My husband and I do weight training together and I have seen great results everywhere but my ab area (of course, he looks amazing all over). My core is pretty strong. I run, weight train, do yoga occasionally and I eat clean for the most part. I’m just not getting the results that I hoped for. Most of the ab workouts that we’ve done, I haven’t been able to feel working, but these I felt immediately. These Ab exercises look great to tone a flabby stomach, however I realize that I have a Diastasis recti which 1.5 finger wide. Can you recommend some exercise to heal my Diastasis recti? Did you have a Diastasis? Hey Kat! I do this 2-3 times per week, making sure to have 1-2 days of recovery in between each time I do it. These are literally the exercises you girls said NOT to do!